The space shuttle is the first reusable space vehicle, designed to perform up to 100 missions with only minor maintenance. The shuttle orbiter resembles an airplane in appearance, but it actually performs quite differently. The shuttle leaves the earth vertically, strapped to a launch rocket for the first stages of liftoff. The shuttle’s main engines provide part of the thrust needed to lift the shuttle into orbit while the rest of the power is provided by the launch rocket. After the mission is completed, the shuttle orbiter returns to the earth in a horizontal position similar to an airplane, but it glides back to earth to land on a conventional runway using no engine power. The space shuttle consists of three main components: an orbiter, an external fuel tank, and two solid rocket boosters. The winged orbiter contains the crew cabin, three liquid-fuel rocket engines for use during launch, and a cargo bay 20 m (60 ft) long. Overall, the orbiter is the size of a medium-sized passenger jet airplane. It is controlled by five onboard computers and is covered with thousands of heat-resistant silica tiles to protect it during the fiery reentry into Earth’s atmosphere. Following reentry the orbiter becomes an unpowered glider, and the shuttle’s commander steers it to a landing on a runway. A total of six shuttle orbiters were built. The first one, named Enterprise, never flew in space, but was used for a series of approach and landing tests in 1977. The shuttle’s other two components help the shuttle reach orbit. The external tank, which is the size of a grain silo, is attached to the orbiter during launch and provides fuel for its engines. The tank is discarded once the shuttle reaches orbit. The paired giant solid rocket boosters, attached to the external tank, provide additional thrust during the first two minutes of launch. After that, they fall away and are recovered in the ocean to be refurbished and reused. On April 12, 1981—exactly 20 years after Gagarin’s pioneering flight as the first human in space—the orbiter Columbia flew a near-perfect maiden voyage. Veteran astronaut John Young and first-time astronaut Robert Crippen piloted Columbia on the two-day mission, ending with a flawless landing on a dry-lakebed runway at California’s Edwards Air Force Base. Three more qualifying flights followed, and in July 1984 the shuttle was declared operational. Over the next 17 months, 20 more shuttle missions, with crews of up to eight astronauts, racked up a string of accomplishments. Shuttle astronauts deployed and retrieved satellites using the orbiter’s remote manipulator arm. In spacewalks, astronauts repaired ailing satellites; they also tested the Manned Maneuvering Unit, a self-contained flying machine with thrusters that use compressed nitrogen. They conducted a variety of scientific and medical research missions in a module called Spacelab, which was stored in the orbiter’s cargo bay. NASA had hoped that the reusability of the shuttle would make getting into space less expensive. The space agency expected that private companies would pay to have their satellites launched from the shuttle, which would provide a cost-effective alternative to launching by a conventional, “throwaway” rocket. However, the costs of developing and operating the shuttle proved enormous, and NASA found it was still a long way from reducing the cost of reaching Earth orbit. To offset these costs, the agency pushed for more frequent launches—in 1986 they hoped to launch 24 missions per year. Then, on January 28, 1986, disaster struck. The shuttle Challenger exploded 73 seconds after liftoff, killing its seven-member crew, which included schoolteacher Christa McAuliffe (see Challenger Disaster). The tragedy shocked the nation and brought the shuttle program to a halt while a presidential commission tried to determine what had gone wrong. The Challenger disaster was traced to a faulty seal in one of the solid rocket boosters, and to faulty decision making by NASA and some of the contractors who manufacture shuttle components. After making several safety modifications, shuttle flights resumed in 1988. Soviet officials viewed the U.S. program with some trepidation, fearing that the shuttle would be used for military offensives against the USSR. Partly in response, they built a heavy-lift booster called Energia, and a space shuttle called Buran (snowstorm). The Buran/Energia combination made only a single unpiloted, orbital test flight in November 1988. Unlike its U.S. counterpart, ground controllers could operate the Soviet shuttle remotely. Buran was far from ready to support piloted flight, and economic problems caused by the collapse of the USSR in 1991 ended the Buran program prematurely. Beginning in 1995, the shuttle flew a series of missions to the Russian space station Mir. In 1998 the shuttle began taking crews into orbit to assemble the International Space Station. The shuttle program’s 100th mission is slated to take place early in 2001, and shuttle orbiters are expected to keep flying during the first decades of the 21st century. Space is a harsh environment for humans and human-made machines. Radiation from the Sun and other cosmic sources can weaken material and harm the human body. In the vacuum of space, objects become boiling hot when exposed to the Sun and freezing cold when in the shadow of Earth or some other body. Scientists, engineers, and designers must make spacecraft that can withstand these extreme conditions and more. The challenges that spacecraft designers face are daunting. Each component of a spacecraft must be durable enough to withstand the vibrations of launch, and reliable enough to function in space on time spans ranging from days to years. At the same time, the spacecraft must also be as lightweight as possible to reduce the amount of fuel required to boost it into space. Materials such as Mylar (a metal-coated plastic) and graphite epoxy (a construction material that is strong but lightweight) have helped designers and manufactures meet the requirements of durability, reliability, and lightness. Spacecraft designers also conserve space and weight by using miniaturized electronic components; in fact, the space program has fueled many advances in the field of miniaturization. Since the early 1990s, budgetary restrictions have motivated NASA to plan projects that are better, faster, and cheaper. In this approach, space missions requiring single large, complex, and expensive spacecraft are replaced with more limited missions using smaller, less expensive craft. Although this new approach was successful with spacecraft such as the Mars Pathfinder lander and Mars Global Surveyor 96, budgetary constraints may have contributed to the loss of two other Mars spacecraft, Mars Climate Orbiter and Mars Polar Lander, in 1999. The approach is also difficult to apply to piloted spacecraft, in which the overriding concern is crew safety. However, engineers are always looking for new technologies to make spacecraft lighter and less expensive. One of the most difficult parts of any space voyage is the launch. During launch, the craft must attain sufficient speed and altitude to reach Earth orbit or to leave Earth’s gravity entirely and embark on a path between planets. Scientists sometimes find it helpful to think of Earth’s gravitational field as a deep well, with sides that are steepest near the planet’s surface. The task of the launch vehicle or booster rocket is to climb out of this well. Although some launch vehicles consist of just a single rocket, many are composed of a series of individual rockets, or stages, stacked atop one another. Such multistage launch vehicles are used especially for heavier payloads. With a multistage rocket, each stage fires for a period of time and then falls away when its fuel supply is used up. This lightens the load carried by the remaining stages. In some liquid-fuel boosters, strap-on solid-fuel rockets are used to provide extra thrust during the initial portion of ascent. For example, the Titan III booster has two liquid-fuel core stages and two strap-on solid-fuel motors. The largest example of a successful multistage booster was the Saturn V Moon rocket, which had three liquid-fuel stages and measured 111 m (363 ft), including the Apollo spacecraft, in length. Despite their utility, most multistage boosters are not reusable, which makes them expensive. Cost-conscious engineers have focused on creating a single-stage-to-orbit (SSTO) vehicle. In an SSTO, the entire spacecraft and booster would be integrated into one fully reusable unit. If successful, this approach would reduce the costs of reaching Earth orbit. However, the technical challenge is enormous: A full 89 percent of an SSTO’s total weight must be reserved for fuel, a much higher proportion than any previous launch vehicle. The payload, the crew, and the weight of the vehicle itself must make up only 11 percent of the SSTO’s total weight. Spaceflight requires very detailed planning and measurement to get a spacecraft into place or to send it on its proper path. Some of the Apollo spacecraft were able to travel from Earth to the Moon (a distance of almost 390,000 km, or almost 240,000 mi) and land on the lunar surface within a few dozen meters (several dozen feet) of their target. Careful planning allowed the Mars Pathfinder spacecraft to fly from Earth to Mars, traveling more than 500 million km (300 million mi), and land just 19 km (12 mi) from the center of its target area. To launch a spacecraft into orbit around Earth, a booster rocket must do two things. First it must raise the spacecraft above the atmosphere—roughly 160 km (100 mi) or more. Second it must accelerate the spacecraft until its forward speed—that is, its speed parallel to Earth’s surface—is at least 28,200 km/h (17,500 mph). This is the speed, called orbital velocity, at which the momentum of the spacecraft is strong enough to counteract the force of gravity. Gravity and the spacecraft’s momentum balance so that the spacecraft does not fall straight down or move straight ahead—instead it follows a curved path that mimics the curve of the planet itself. 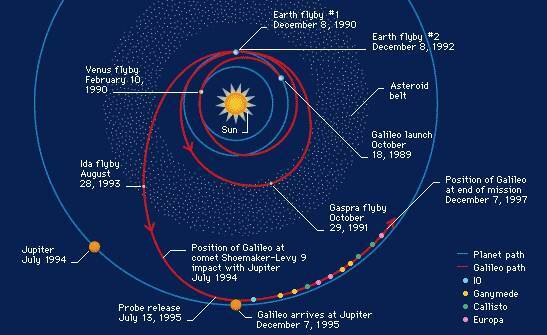 The spacecraft is still falling, as any object does when it is released in a gravitational field. But instead of falling toward Earth, it falls around it. See Orbit.